Geisert Farms: braunschweiger and breakfast sausage: Not to steal a phrase made famous by someone else, but OH MY DAMN. No offense to 5 Guys bacon, but this is how pork is supposed to be. Growing up in Toledo meant that pork products came from Kilgus Meats (which is an incredibly awesome place if you’re in the NW Ohio/SE Michigan area), and I’ve been lamenting the fact that I couldn’t find anything to measure up to that level of quality in my new home. But at last piggy salvation is at hand! And I couldn’t be happier. Goshen Coffee: I have always considered myself a coffee drinker but not a coffee connoisseur. I was fine with buying pre-ground coffee and was quite sure that buying a coffee grinder of my own would be a waste of time and money. The Gastrognome, being more of a tea drinker to begin with seemed to agree. Then, one week we got this Goshen coffee in our share. Now we own a coffee grinder. Fresh eggs all the time: It’s almost disturbing how much better fresh eggs are than grocery store eggs. Even aside from the fact that they’re not dipped in bleach baths to turn them pure white, fresh eggs have an intensity of flavor and color that your standard off-the-shelf egg cannot match. Fresh eggs are super freakin’ sweet. Being able to get them all the time (okay, once a week, but still!) is incredible. Fun New Stuff: Have you ever seen watermelon radishes or sunflower shoots in a major grocery store? If yes, then you are far luckier than we are. Not only do we look super cool, we also taste delicious. Being a part of the CSA gave us the chance to try these (and many other things) out for the first time though. And they are great. So great, in fact that we’ve decided to increase our share to a full, weekly one starting this spring. It’ll mean that we’re getting enough food this way that we’ll be forced to come up with creative, new ways to use it all, which is an adventure that we’re both looking forward too and which we hope (well, barring excessive laziness/procrastination) to further document here! So stay tuned! I guess I’m the only one without a local CSA here in To-Le-DOH! I have a half acre of semi-urban land…I’ll just start my own. Yaaaaaay! Glad to hear yours is providing the same adventure and fun that mine does. 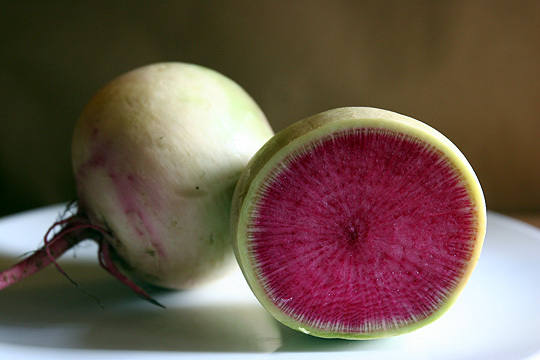 That radish looks rad-ish, by the way. @princesszyrtec Yeah that’s pretty dumb considering how much of my CSA is probably closer to the ‘DOH. I think I’ve said that before though….